Cypress Semiconductor is moving rapidly to make the most of these two fast-growing markets. 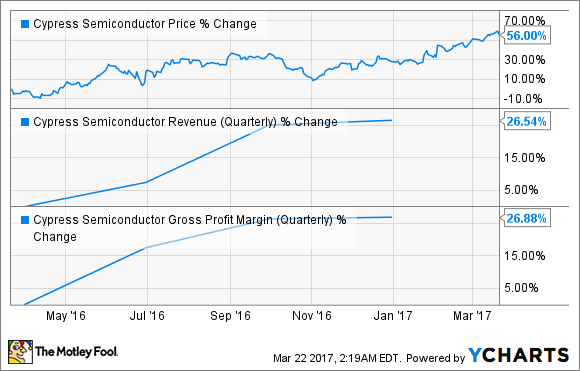 Shares of Cypress Semiconductor (NASDAQ:CY) have shot up almost 60% in the past year, thanks to a string of impressive quarterly results and consistent financial improvements. The semiconductor specialist now trades near its 52-week high and could receive a nice boost in the latter half of the year if a design win in the next iPhone materializes. Apple, however, is not the only catalyst for the chipmaker, as Cypress is targeting the Internet of Things (IoT) and connected cars to cash in on the huge potential in those markets. Cypress is sitting on a multibillion-dollar opportunity in the automotive space as its chips will enable connectivity in the cars of tomorrow. NXP Semiconductors estimates that the chip content in each vehicle will jump from $332 in 2015 to an average of $374 in 2019, pushing the size of the automotive semiconductor market to $36 billion. Not surprisingly, Cypress has built an exhaustive road map to target this area as it plans to supply touchscreen controllers, flash memory, and power management chips, and enable wireless applications for connected cars. The good news for investors is that its automotive products have started gaining traction with Tier 1 component suppliers such as Continental, which will use Cypress' Traveo II family of microcontrollers to control doors, windows, seats, sunroofs, and even wireless charging terminals. Cypress claims that the Traveo microcontrollers consume less power, making them ideal for controlling a car's electronics as they are light on the battery. What's more, the scalability of the microcontrollers will allow component suppliers to deploy them across a wide number of applications. This makes Cypress' design win at Continental a big deal as the German giant pulled in over 40 billion euros in revenue last year, and is the fourth-largest supplier of automotive components. More importantly, the new automotive product line could soon start contributing to the chipmaker's revenue as it will start sampling it in the second half of the year. The Internet of Things is another fertile area where Cypress has been making rapid inroads by unveiling a string of products. It recently launched new microcontroller architecture, along with two new wireless solutions, to attack the IoT opportunity that could be as big as $30 billion for chipmakers in 2019, according to IC Insights. Cypress' new microcontroller architecture is built for low power consumption and comes equipped with security standards that allow IoT devices to communicate safely, without the need for any external safety features. The company expects to start mass producing this product line in the fourth quarter. On the other hand, the wireless solutions combine Wi-Fi, Bluetooth, and low-power Bluetooth to give IoT devices a wider range and faster download speeds, making them ideal for use in smart-home products. Smart homes look to be one of the fastest-growing segments of the Internet of Things, with IC Insights estimating that the chip opportunity could be $1 billion by 2019. Not surprisingly, Cypress is rapidly rolling out new products aimed at the IoT market, while also striking partnerships to boost product innovation and reach. In March, Cypress penned an agreement with electronics components supplier Arrow Electronics to provide analytics and security capabilities to the latter's IoT products. In return, Cypress stands to benefit from Arrow's huge customer base in the data center and the cloud markets as it supplies its electronic components to over 125,000 manufacturers across 465 locations in 90 countries. Cypress Semiconductor is following a smart strategy of piggybacking on other companies to further the reach of its IoT and automotive products. This will help the company move at a fast pace in these rapidly growing markets, and could substantially increase its revenue in the long run as the products start gaining traction.